Just as a framework is necessary in drawing the head, so is it necessary in drawing a body for the head. You should know the proportions of a comic figure. Since comic figures may be such gross exaggerations, the proportions of the limbs and torso may vary much in various types, especially between slender and corpulent figures. Note the proportions of Figures 3 and 5 on Plate 9. However, in the average figure, the torso and legs are of equal length with the knee midway of the leg J, exclusive of the foot. The hands should reach midway of the thf^fr and the elbow half way of the arm, which makes the elbow near the hip when the arms hang vertically. For the beginner or amateur, it is better to draw a sort of skeleton for a guide as in Figure A, Plate 9. Next block in body, legs and arms. Draw head as in Figure 1. Draw clothing, adding buttons, wrinkles, etc., to give it life, as in Fig, 2, and finish as in Fig. 3. 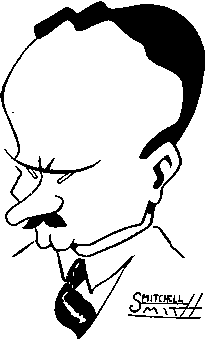 The same procedure is used, in drawing a sideview comic figure. This is illustrated by Figures 4, 5, and 6 on the same plate. Figure 7 shows a different technique. The most difficult part of the body to draw is the hand. The amateur should give this item a good deal of study and practice, drawing from his own hands as a model, and from other artists'' work. It would be wise to clip hands that are good in various positions, from cartoons to keep for reference or models when needed. Quite a lot of humor can be added by well drawn and well placed hands and feet. the foot, and drawing it in other awkward positions. The shoes should be in keeping with the other clothing. That is, a well dressed man has shined shoes, while a hobo has ragged, worn out shoes. The rich man is usually represented with patent leather shoes with white spats as Figure 6, Plate 9. Gothing is really a little difficult, but much diligent study gets fine results here as everywhere else. It should fit the body and should drape naturally to get a good effect. Wrinkles and folds are used for this purpose at the shoulders, elbows, knees, and elsewhere. See examples of this on Plates 9,10,11 and 12. Note also how the tie and collar are drawn, the lapels, buttons, buttonholes and pockets. However, a good comic figure must have action and proper shading. These will be treated in the two succeeding chapters.